Karen Mulder before and after plastic surgery. Karen Mulder is a tremendously successful Dutch model who rose to fame in early 90's after gracing the catwalk for such designers as Valentino, Giorgio Armani and Versace. She soon established her name high atop the industries leading models, along side the sleek physiques of Naomi Campbell and Kate Moss. 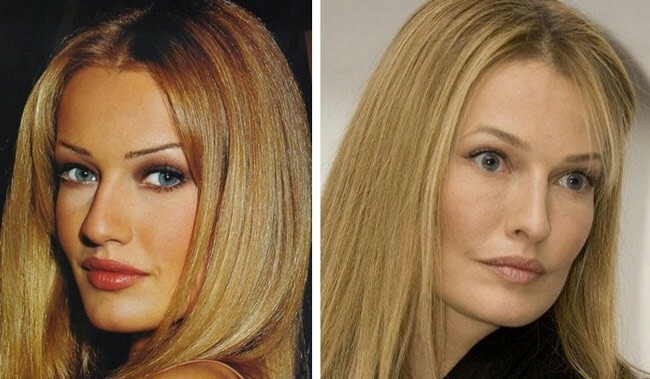 It was all rainbows and lolly pops back then, aside from her bout with chronic depression and drug addiction, however more recently Karen Mulder has fallen on tough times after undergoing plastic surgery and then later allegedly threatening to attack her plastic surgeon. It was never made clear which particular plastic surgery procedure the model was upset with, but these before and after pictures give us a good idea of what tool place. From the looks of these snapshots along with the rumors plastered around the internet, it would appear that Karen Mulder underwent the following operations. A tightly pulled facelift, along with cheek implants and a few doses of botox or facial fillers such as juvederm or restylane. The fact of the matter is, there is always going to be a risk of undesirable plastic surgery results, and no matter how many threatening phone calls you make to the plastic surgeon, whats done is done. 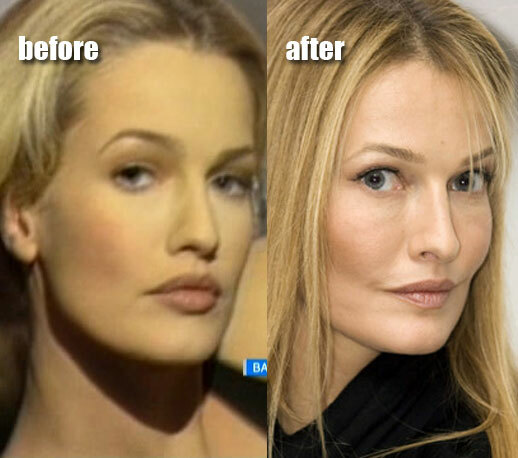 Surely you are chomping at the bit about Karen Mulder's plastic surgery mishap, so lets hear what you have to say! Keep it respectable if possible. It's sad because she was very beautiful before having those procedures done .. She was one of my favorite models in the 90's .. She should have left well enough alone .. When you are already that beautiful why on earth would you get plastic surgery? She clearly also refined her nose, which robbed her of her aristocratic profile. It's incredible that she would have succumbed to plastic surgery, given that she was an absolutely stunning beauty, no surgeon could have improved upon. She must've been drugged out of her mind.